So, it’s the Lunar New Year again, this time the year of the rat. And so, a typical question on everybody’s mine is, how will my year be in the year of the rat? chinese.astrology.com has the rundown for the year ahead. 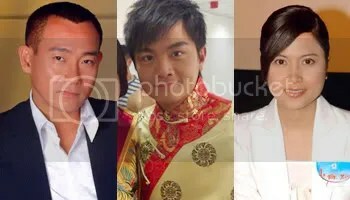 For a good bit of fun in the CNY manner, let’s see what happens when we apply those forecasts to our favourite TVB stars. Out of the year ahead, apparently eight months are favourable for the Rat. The year may get off to a slow start for them, but the latter part of the year will hold bigger and better opportunities – patience will be a virtue. Bobby has a new drama which is currently filming which also stars Sheren Tang that could very well lead to many advertising opportunities towards the end of the year. Matthew and Linda also have Man in Charge, and A Journey Called Life and The Gem of Life respectively, ready for release very soon. For the Rat, this year is also the best time for career advancement; both Matthew and Vivien have been given very big opportunities of late – could this be their time to shine? When it comes to love, there is a high possibility that a recent acquaintance or a newly formed friendship could develop into a serious love affair. Maybe those Matthew/Kate Tsui rumours might come true soon. The year of the rat is a win-lose situation for the Ox. According to the experts, the ox will face half a year of difficulty, with the ending half favourable. This will not the time to take risks, especially unnecessary or avoidable risks. Hard work is more the Ox’s style anyway; this is very true for both Damian and Ada whose pure hard work and talent within the entertainment circle over the years is widely known. As for the Ox’s relationships, one bright spot may lay in their family relationships, as they might offer you a measure of unconditional love. This bodes well for the newlywed Ada and her loving husband, Max. 42% of the year will apparently be favourable for the tiger in the year of the rat. The Tiger will have to carefully pick their battles, as they probably will not be blessed with many good opportunities. This might not be true for Kenneth as he has a truckload of series due for airing this year. Patrick is also rather favoured by the bosses, and he has the famous Foodie 2 Shoes under his belt. This leaves us with the ladies. Sonija already had a horrible year last year, what with the Michael Tao and third party rumours, so let’s hope this forecast doesn’t come true with a repeat of last year occurring. The Tiger will also gain a lot in friendships and have a fulfilling social life but the only bump in the road may come in their romantic relationships, as their aggressive approach may not find favor in this conservative Earth element year. Hopefully this doesn’t affect Joyce and what seems like a burgeoning relationship with Derek Kwok. With 11 favourable months and 1 neutral month, the Dragon could be the best off amongst all the other zodiacs. Dragons, while having to avoid risk, will have a good chance of realising a big dream this year. Maybe Margaret will be able to expand her yoga venture this year. The year of the Rat also seems to smile on the career of the Dragon. With creativity, heart and spirit, points could be won with those in authority and advancements in career are highly likely. The star of Roger can only go higher with D.I.E. and thriller Last One Standing, while Derek who did great last year, could stand to gain even more recognition this year. Margaret and Annie should also consider filming for TVB again. I’m sure a lot of viewers would agree with that. Equally lucky in relationships, the Dragon stands to find romance, or even better, his or her soulmate this year as it is a very auspicious year for love – love might soon be in the air for singles like the very eligible Derek (Joyce Tang anyone? ), Margaret and Annie. The earth element of 2008 also favors family and heart-felt gestures, perfect for Roger and his wife Cindy Au, who will be happy parents very soon! With one less favourable month as compared to the Dragon, the year of the Rat will be a better one for the Snake than last year. Almost every month will present a new opportunity to the snake, although they might want to take a break straight after the Lunar New Year. With the mega-production of The Gem of Life looming ahead for both Bowie and Maggie, the year is bound to be bountiful, and after filming it for many long months last year, a break after the new year is in store for the two. Also, the fast paced energy given off by the Rat creates a dynamic career environment which could inspire the Snake with new ideas resulting in many opportunities which requires quick and decisive actions. If the Snake is bored with their present work situation, this is a good time to seek greener pastures. Could this be a hint to Jack to leave the hosting behind and to continue to carve a name for himself in the acting industry? Single Snakes have a wonderful chance to find love and romance, or maybe just one great fling. All three of them should take note! With only three neutral months and the remaining months being unfavourable, it looks to be a tough year ahead for the Horse. A quick start to the year will be important as the latter months of the year could be very challenging indeed. Might that mean awards at the end of the year will once again elude Sammul and Bernice? Projects will become a bit more difficult and delays could be the norm. Hopefully this does not affect Bernice who’s currently filming The Legendary Ren Jie and Sammul, who will soon begin filming The Academy III, or cause Shirley‘s Silver Mansion Golden Dust to be warehoused. While they may experience some bumps in the road, there will be have many opportunities to learn and it might be beneficial to further their work-related knowledge; Bernice and Stephen should continue working hard on improving their pronounciation. When it comes to romance, letting their guard down, especially with those who love them, is one way to happiness. Might Bernice be letting her guard down with a certain Best Actor? The Horse will be best served by exercising patience and understanding the needs of his or her partner. Shirley and long-time boyfriend Gregory Lee should take note, just in case. With only 5 favourable months, this year will not be as good as the pig year last year for these sheep. However, it is important to note that there are still five favourable months will plenty of opportunities if the Sheep does not get down and let negative emotions get the best of them. All four stars have big projects at hand with many opportunies; Raymond has The Four and Heart of Greed II, Ron with The Four and possibly Thirteen Treasures, Myolie with When A Dog Loves A Cat and apparently Burning Flame III after that, and Tavia with Salt Traders and Heart of Greed II. They will do best this year if they let their head, and not their heart dictate their actions. Ron made a smart choice by branching out to the mainland market last year, and his career might continue rising with the awaited The Four and the filming of the The Academy III. Career-wise, the Sheep might face large pressure from management to work more. Advancement and progress will come if there is strong diligence, of which there is definitely no shortage of when it comes to these four. The sheep must remain rational about their workload and pressure and their inclination to say no if the load is too much to handle. The quartet of Raymond, Ron, Myolie and Tavia are the cream of the crop of the younger generation and are possibly the most overworked ones. This year they might have to learn to face even larger pressure and juggle their work and home life well. For the single Sheep like Raymond, Ron and Tavia, this year could lead to the blossoming of true love. However, existing relationships could be problematic. At the same time, they need to be wary of rumors and gossip, as they will lead to unnecessary arguments. Myolie and rumoured guy Bosco Wong sound familiar? Along with the Dragon, the Monkey will have the best year this year out of the twelve zodiacs. Opportunities will be aplenty for the typical, mentally quick and multi-talented Monkey. However, overconfidence could hinder some of those opportunities. The monkey is advised to go with their heart and follow their instincts with their projects at hand. Rewards will be seen when working closely with coworkers who exhibit similar ideas. Bosco, while working closely with his great coworker Myolie Wu reaped great rewards with their outstanding chemistry last year with War of In-Laws II; might that continue in the following year as well? Ideas and hard work will most likely be rewarded this year. Joe, who has signed a contract with TVB late last year could see himself rewarded as early as the end of this year at the anniversary awards. A resurgent Elaine , and well as newbie Carrie could also see themselves with more chances. The monkey’s social life should be very active this year. Married ones like Joe will find themselves more than ever, wanting to spend a lot of time with their spouse and might even lead to an addition in the family! The single Monkey should expect to find an abundance of opportunities in love and this might not be the year to settle down. Oh no, does that mean there’s no hope for Bosco and Myolie after all? After the Horse, the Rooster is the sign most likely to have a challenging year with a total of 9 unfavourable months. There will, nevertheless, be a few opportunities. With a big role in The Four, Selena‘s opportunities will probably come in abundance after its release. A cooperative attitude, and winning allies will be the key to success. With Leila‘s amiable work ethics and her budding success with her music and the mainland market, she should do well. Progress may be a little slow on the career front this year for the rooster but time must be taken to understand the roots of the problems. Support of co-workers and superiors are vital. Such a well-respected and well-liked veteran like Paul probably need not worry. One of TVB’s favourite sons, Kevin will also probably be in a good spot with the support for the upcoming The Seventh Day and the anticipated Last One Standing. The single Rooster like the beautiful Leila , need not rush into anything new this year, as things may not always be quite what they seem. The Rooster in a relationship needs to be wary and avoid missteps, as small problems have the potential to erupt into larger, out-of-hand ones this year. Might rumoured couples Kevin and Niki Chow, along with Selena and Patrick Tang have anything to worry about? Added stressed caused from relationship problems could be detrimental to their health. Let’s hope all four stay healthy and happy in ’08! More than half the year is deemed to be positive for the Dog in 2008. For them, it will be more challenging than last year, but still has the potential to be very favourable. With the release of Suspicious Love for Michael and the upcoming The Academy III and Heart of Greed II for him and Fala respectively; that is most definitely valuable potential. Jessica has also apparently been slated to film Just Love II soon. Willingness to leave their comfort zone will lead to significant progress towards the dog’s goals and enable them to achieve one or more notable successes. Jessica left her comfort zone last year with her soft-spoken, timid role in Drive of Life which was widely acclaimed. Fala could very well continue that streak by taking on the role of a mute this time round in HOG II. Time spent promoting themselves and their skills and standing out to the people on the company ladder will be well-spent. Fala‘s popularity rose last year with her dancing skills; will she continue on this year? Domestically, comfort will be found in family relationships this year, be it with parents, children or loved ones. The single ones like the very eligible Jessica, will find good fun and mental stimulation this year; with plenty of chances to meet new friends and explore new love interests. The Year of the Earth Rat will likely be favorable towards their new savings plans and investment decisions; possibly a good year for Michael‘s business up ahead! Said to be the most generous and honorable zodiac sign, these four are in for a good year this year. The environment is likely to be more unsettling, albeit simultaneously providing more opportunities for success. The formidable Moses won big at last year’s awards; imagine what more he could do this year. The boar needs to mentally adjust his or herself and focus squarely on the present this year. Gigi had a turbulent year last year with her brother’s incident, and there’s nothing better to do than to focus and live to the fullest in both family and career. Increased success is in store for the boar; they just need to stay focused on the prize. Great advice for a budding newbie like Koni. Their work environment is more comfortable this year and people around them will be appreciative of their experience and talent. Might Steven be able to win Best Actor this year with this added appreciation? The single Pig will find plenty of opportunities this year and love is in the air, possibly along with a new career connection or two. Moses, who has all along endorsed the idea of appearing as a celebrity advertising couple with Bernice Liu for work and sponsor-related purposes, has been the brunt of good-natured marriage ribbing from colleagues recently. Might there be more than just a career connection there? The pace of the year also poses some risk to your health and well-being and any risky physical activity should be avoided. Let’s all pray for no more horse mishaps for the poor Steven. We want to see both his eyes if/when he wins an award this year. Just a good bit of fun forecasting the year ahead traditional Chinese-style with the twelve zodiacs and the TVB artistes. I don’t personally believe in astrology, but I like to read it just for fun… who knows, right? Lol. And I would like to take this opportunity to wish everyone a very happy belated Valentine’s day! xoxo. this was really interesting…i was most interested in moses & bernice’s…it mustve taken you a long time to gather all the artistes information… good job!!! Wikipedia was most helpful with their years of birth, lol. Glad you found it interesting! wad in interesting article…I didn’t noe..steven is of the same age as moses, I tot he’s younger…and of course, I’m much more interested in my rabbit and Bermo! But I like them all…pretty entertaining!